About this Gildan(R) Adult Heavy Cotton(TM) T - Shirt - 5000:Preshrunk 100% Cotton Jersey (Blended Cotton/Polyester In Antique, Heather, Neon And Safety Colors).5.3 oz.Seamless Double-Needle ⅞" Collar.Taped Neck And Shoulders.Double-Needle Sleeve And Bottom Hems.Quarter-Turned To Eliminate Center Crease.Special Instructions:Multicolor imprint is available, Please call for service. About this Delta(R) Pro Weight(TM) Unisex Short Sleeve Tee - 11730:100% Pre-Shrunk Cotton (50% Cotton / 50% Polyester In Safety Green & Safety Orange).5.2 oz / 176 GSM.Short Set-In Sleeves.Taped Neck And Shoulder Seams For Durability.Two-Needle Hemmed Sleeves And Bottom Won't Unravel.Tagless Private Label Option.¾" Rib Knit Collar.Heathered Colors Have Polyester Content.Machine wash cold with like colors. Only non-chlorine bleach when needed. Tumble dry low. Do not iron or dry clean.Special Instructions:Multicolor imprint is available, Please call for service. About this Bodie Short Sleeve Tee By TRIMARK - Mens:Ultra soft and comfortable, the Bodie is an essential tee for any corporate, food services, team and school. The Bodie Short Sleeve Tee features a rib crew neck collar with chain stitch detail. Available in 8 trendy colors, this tee will enhance your brand. Decorate with the new inFusion decoration for maximum brand exposure from seam to seam. About this Bodie Short Sleeve Tee By TRIMARK - Womens:Ultra soft and comfortable, the Bodie is an essential tee for any corporate, food services, team and school. The Bodie Short Sleeve Tee features a rib crew neck collar with chain stitch detail. Available in 8 trendy colors, this tee will enhance your brand. Decorate with the new inFusion decoration for maximum brand exposure from seam to seam. 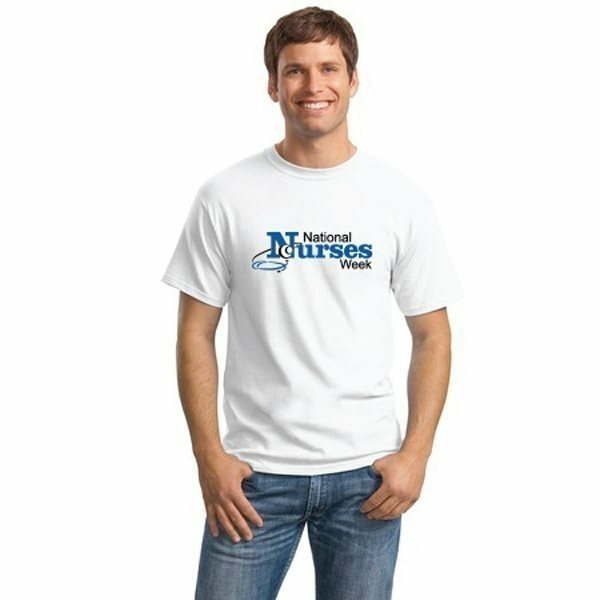 About this Gildan(R) Adult DryBlend(R) T - Shirt - 8000:Preshrunk 50% Cotton/50% Polyester Jersey Knit.5.6 oz.Seamless Double-Needle ⅞" Collar.Taped Neck and Shoulders.Double-Needle Sleeve and Bottom Hems.DryBlend® Technology Delivers Moisture-Wicking Properties.Quarter-Turned To Eliminate Center Crease.Machine wash warm, inside out, with like colors. Only non-chlorine bleach. Tumble dry medium. Do not iron. Do not dry clean.Special Instructions:Multicolor imprint is available, Please call for service. About this Delta(R) Ringspun 30/1s Unisex Adult Fitted Tee:100% Pre-Shrunk Ringspun Cotton (Heathered Colors Have Polyester Content).4.3 oz / 146 GSM.Short Set-In Sleeves.Taped Neck And Shoulder Seams For Durability.Two-Needle Hemmed Sleeves And Bottom Won't Unravel.3/4" Seamed Rib Knit Collar.Tagless Private Label Option.Special Instructions:Multicolor imprint is available, Please call for service. 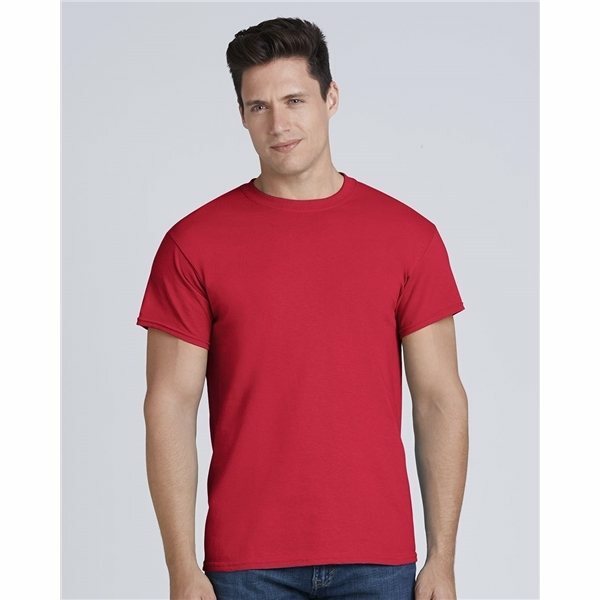 About this Gildan(R) Softstyle(R) Adult T - Shirt - 64000:Preshrunk 100% Ring-Spun Cotton Jersey Knit (Blended Cotton/Polyester In Heather Colors).4.5 oz.Seamless Double-Needle ¾" Collar.Taped Neck And Shoulders.Rolled-Forward Shoulders For Better Fit.Double-Needle Sleeve And Bottom Hems.Quarter-Turned To Eliminate Center Crease.Select Colors Up To 3XL.Machine wash warm, inside out, with like colors. Only non-chlorine. bleach. Tumble dry medium. Do not iron. Do not dry clean..Special Instructions:Multicolor imprint is available, Please call for service. About this Port Company(R) Cotton T - Shirt - PC54:5.4 oz.98/2 Cotton/Poly (Ash).90/10 Cotton/Poly (Athletic Heather).50/50 Cotton/Poly (Neon Blue, Neon Green, Neon Orange, Neon Pink, Neon Yellow, Dark Heather Grey, Heather Athletic Maroon, Heather Purple, Heather Navy, Heather Red, Heather Royal, Heather Sangria, Heather Dark Chocolate Brown).Tag-Free Label.100% Cotton.Special Instructions:Multicolor imprint is available, Please call for service. About this Hanes(R) ComfortSoft(R) 100 Cotton T - Shirt - 5280:5.2 Oz., 100% ComfortSoft® Cotton.Double-Needle Coverseamed Crewneck.Lay-Flat Collar.Shoulder-To-Shoulder Taping.Double-Needle Sleeves And Hem. About this Gildan(R) Apparel Kit - Adult:Kit Contains: White Gildan T-Shirt, Small Hit Sports Pack in your choice of color and Poly-Clean 28 oz Bottle in your choice of color.Pricing Includes a 1 Color Imprint in 1 Location on Each Item.Special Instructions: Price included 1 color/location imprint on productand gift box. About this Adult 5.2 oz Cotton Long Sleeve T - Shirt - Screen:Adult 5.2 oz. Cotton Long Sleeve T-Shirt with 100% Pre-Shrunk Cotton (50% Cotton / 50% Polyester In Safety Green & Safety Orange) .5.2 oz / 176 GSM.Long Set-In Sleeves With Rib Knit Cuffs For Stretch And Recovery.Taped Neck And Shoulder Seams For Durability.Two-Needle Hemmed Sleeves And Bottom Won't Unravel.Tagless Private Label Option.Seamless Rib Knit Collar.Heathered Colors Have Polyester Content .Machine wash cold with like colors. Only non-chlorine bleach when needed. Tumble dry low. Do not iron or dry clean.Special Instructions:Multicolor imprint is available, Please call for service. About this Gildan(R) Adult Ultra Cotton(R) Long Sleeve T - Shirt - 2400:Preshrunk 100% Cotton Jersey (Blended Cotton/Polyester In Ash, Sport Grey And Safety Green).6 oz.Double-Needle ⅞" Collar.Taped Neck And Shoulders.Rib-Knit Cuffs.Double-Needle Bottom Hem.Quarter-Turned To Eliminate Center Crease.Machine wash warm, inside out, with like colors. Only non-chlorine bleach. Tumble dry medium. Do not iron. Do not dry clean.Special Instructions:Multicolor imprint is available, Please call for service. About this M - Sarek Short Sleeve Tee:The Sarek Short Sleeve Tee is a new twist on a summer essential. Available in a new color palette of 8 new colors, the Sarek tee will brighten up your summer.It features a crew neck, self-fabric collar and chainstitch detail. Fabric: 65% Polyester 35% Cotton cross dyed jersey knit. 120 g/m2 (3.5 oz/yd2) HEATHER COLORS. 65% Polyester 35% Cotton slub yarn jersey knit. 155 g/m2 (4.6 oz/yd2) SOLID COLORS-SLUB KNIT. 65% Polyester 35% Cotton jersey knit. 140 g/m2 (4.1 oz/yd2) SOLID COLORS. About this Gildan(R) Adult Ultra Cotton(R) T - Shirt - 2000:Preshrunk 100% Cotton Jersey (Blended Cotton/Polyester In Antique, Heather And Safety Colors).6 oz.Seamless Double-Needle ⅞" Collar.Taped Neck And Shoulders.Double-Needle Sleeve And Bottom Hems.Quarter-Turned To Eliminate Center Crease.Machine wash warm, inside out, with like colors. Only non-chlorine bleach. Tumble dry medium. Do not iron. Do not dry clean.Special Instructions:Multicolor imprint is available, Please call for service. About this Delta(R) 30/1s Soft Spun Adult Fitted Tee:100% Pre-Shrunk Soft Spun Cotton (Heathered Colors Have Polyester Content).4.3 oz / 146 GSM.Short Set-In Sleeves.Tagless Private Label Option.Taped Neck And Shoulder Seams For Durability.Two-Needle Hemmed Sleeves And Bottom Won't Unravel.3/4" Rib Knit Seamless Collar.White Is Sewn With Cotton Thread For Garment Dying. Available To 3XL.Machine wash cold with like colors. Only non-chlorine bleach when needed. Tumble dry low. Do not iron or dry clean.Special Instructions:Multicolor imprint is available, Please call for service. About this Delta(R) Ringspun 30/1s Unisex Adult Athletic Fitted Tee:100% Pre-Shrunk Ringspun Cotton (Heathered Colors Have Polyester Content).4.3 oz / 146 GSM.Short Set-In Sleeves.Taped Neck And Shoulder Seams For Durability.Two-Needle Hemmed Sleeve And Bottom Hems.3/4" Rib Knit Collar.Tagless Private Label Option.Machine wash cold with like colors. Only non-chlorine bleach when needed. Tumble dry low. Do not iron or dry clean.Special Instructions:Multicolor imprint is available, Please call for service. About this Delta(R) Magnum Weight(TM) Adult Short Sleeve Tee:100% Pre-Shrunk Cotton (Heathered Colors Have Polyester Content).6 oz / 203 GSM.Seamless Rib Knit Collar.Coverseamed Front Neck Adds Durability.Taped Neck And Shoulder Seams For Durability.Two-Needle Hemmed Sleeves And Bottom Won't Unravel.Tagless Private Label Option.Short Set-In Sleeves.Machine wash cold with like colors. Only non-chlorine bleach when needed. Tumble dry low. Do not iron or dry clean.Special Instructions:Multicolor imprint is available, Please call for service. About this Jerzees(R) Adult Dri - Power(R) Active T - Shirt - 29MR:50/50 Cotton/Poly.5.6 oz.Double-Needle Coverstitched Front Neck.Shoulder-To-Shoulder Tape.Double-Needle Stitched Hemmed Sleeves And Bottom.Machine wash warm with like colors only. Remove promptly, tumble. dry low. Use non-chlorine bleach only when needed. Do not dry. clean or iron emblem.Special Instructions:Multicolor imprint is available, Please call for service. About this Port Company(R) Essential T - Shirt - PC61:Heavyweight 6.1 oz.100% Soft Spun Cotton.98/2 Cotton/Poly (Ash).90/10 Cotton/Poly (Athletic Heather).50/50 Cotton/Poly (Dark Heather Grey).Special Instructions:Multicolor imprint is available, Please call for service. About this Port Company(R) Core Cotton Camo Tee:100% Cotton.5.4 Oz.Tagless Private Label Option.Special Instructions:Multicolor imprint is available, Please call for service. About this Next Level(TM) Mens Triblend Crew - 6010:4.2 Oz.50/25/25 Polyester/Combed Ringspun Cotton/Rayon.32 Singles.Fabric Laundered For Reduced Shrinkage.Set-In 1x1 Baby Rib Collar.Satin Tag. About this W - Mori Long Sleeve Polo:The versatile Mori Polo is a classic long sleeve look that offers exceptional performance, with features like Webtech moisture management, UV protection, and fabric thats snag resistant. The mens version features a three-button placket, while the womens offers a more casual silhouette, with shaped seams, a dropped back hem and a tapered waist for a flattering fit. About this Port Company(R) Ringspun Cotton Tee:5.5 Oz.100% Ringspun Cotton.90/10 Ringspun Cotton/Poly (Athletic Heather).Removable Tag For Comfort.Tagless Private Label Option. About this M - Banfield Short Sleeve Polo:The Banfield Short Sleeve Polo is a Cotton / Polyester blend pique knit with a 3-button placket, dyed-to-match buttons, flat knit collar and sleeve cuffs and upper patch pocket. This polo has Caretech properties for an easy wash and wear with low shrinkage, fade resistant, commercial laundry wash and up to 5XL sizes. A great polo for team, corporate, golf and resort. Available in four colors.Fabric: 65% Polyester 35% Cotton pique knit, 200 g/m2 (5.9 oz/yd2). 65% Polyester 35% Cotton flat knit collar and sleeve cuffs. About this Delta(R) Ringspun 30/1s Unisex Adult Snow Heather Fitted Tee:58% Cotton / 42% Polyester .4.3 oz / 146 GSM.Short Set-In Sleeves.Taped Neck And Shoulder Seams For Durability.Two-Needle Hemmed Sleeves And Bottom Won't Unravel.3/4" Seamed Rib Knit Collar.Tagless Private Label Option.Machine wash cold with like colors. Only non-chlorine bleach when needed. Tumble dry low. Do not iron or dry clean.Special Instructions:Multicolor imprint is available, Please call for service. About this Gildan(R) Softstyle(R) Ladies T - Shirt - 64000L:Preshrunk 100% Ring-Spun Cotton Jersey Knit (Blended Cotton/Polyester In Heather Colors).4.5 oz.Junior Contoured Silhouette With Side Seams.Seamless Double-Needle ½" Collar.Taped Neck And Shoulders.Double-Needle Sleeve And Bottom Hems.Machine wash warm, inside out, with like colors. Only non-chlorine. bleach. Tumble dry medium. Do not iron. Do not dry clean.Special Instructions:Multicolor imprint is available, Please call for service. About this Next Level(TM) Premium Fitted Short - Sleeve Crew - 3600:Fabric Laundered For Reduced Shrinkage.100% Combed Ring-Spun Cotton High-End Jersey (Blended Cotton/Polyester In Heather Colors).4.3 oz.32 Singles For Extreme Softness.1x1 Baby Rib-Knit Set-In Collar.Tear-Away Label.Machine wash cold. Do not bleach. Tumble dry low.Special Instructions:Multicolor imprint is available, Please call for service. About this District(R) Young Mens The Concert Tee(TM) - DT5000:4.3 oz.100% Soft Spun Cotton, 30 Singles.50/50 Soft Spun Cotton/Poly (Neon And Heathered Charcoal).90/10 Soft Spun Cotton/Poly (Heather Grey).Tear-Away Tag. About this Port Company(R) Ladies Performance Blend V - Neck Tee:65/35 Poly/Cotton.4.5 Oz.Side Seamed With A Contoured Body For A Feminine Fit.Tagless Private Label Option.Special Instructions:Multicolor imprint is available, Please call for service. About this District(R) Young Mens The Concert Tank(R):4.3 Oz.100% Soft Spun Cotton.50/50 Soft Spun Cotton/Poly (Neon).30 Singles.Tear-Away Tag.Tagless Private Label Option.Special Instructions:Multicolor imprint is available, Please call for service. Thank you Gigi and Tikia! Apparel is a top promotional item that most customers remember, and for the Custom Gildan Heavy Cotton T Shirt it has to be the variety of colors. Available in: Blackberry, Dark Heather, Heather Military Green, Heather Red, Heather Sapphire, Lilac, Midnight, Russet, Safety Green, Safety Orange, Sunset and Tweed are 50/50 cotton/polyester. Antique Cherry Red, Antique Irish Green, Antique Jade Dome, Antique Orange, Antique Sapphire and Sport Grey are 90/10 cotton/polyester. Ash is 99/1 cotton/polyester. It’s no wonder this product in on our Top 100. Always represent with our top standard brands. Get your Custom Gildan Heavy Cotton T Shirt, order here! Thank you Jon and Kita, we’re glad your orders went smoothly. For every order, we make sure that each product is built to perfection. Since this item is on our list of Top 100, we know this popular T Shirt is one everyone will love. Staple item and our best seller. Allows for 2 color imprints on 1 location that are offered at this special rate. Voted 'Top 100' item that is sure to be a HUGE success at any event. Offers multiple imprint method options, making this item a breeze for easy branding. Let us help complete your order for your next event. We will guarantee you complete satisfaction on your order, order now! AnyPromo’s customer service team have been recognized for their professionality. They strive to reach out to customers even when their order is complete. Want to talk to a customer service representative for this item? Live chat with them now to get more details. Our T Shirts are on of the most hottest apparel items that customers love to order, and that’s because people love them! Don’t miss on this opportunity, click here to order! With over 1550 different styles of T Shirts and Tanks, the choice of selecting a particular style for your next event will be a breeze. We know our apparel is a top hit for AnyPromo. With our T Shirts and Tanks, your company will have the hottest apparel. Want to see our T Shirts? Click here! Our personalized t-shirt apparel is designed for performance and fashion to keep brand loyalists coming back for more. Every jersey, cotton v-neck and football tee is specially priced and professionally imprinted to vividly promote your brand. Let’s make marketing make sense! Search our site for a wide selection of promotional tees and tanks. Check out even more cool t-shirt apparel on sale now! Take a peek at our fashionable and comfortable selection of promotional tees and tanks currently available. We’re ready to help expedite your order, so give us a call! Brand fans love these promotional gifts! From Fruit of the Loom to Hanes, AnyPromo will always make sure that our products represent who we are. Once the product is imprinted for your next event, the product will then represent you, and we guarantee it to be a hit! T Shirts are a huge hit for tradeshows. Everyone loves to win things at events, so if you’re planning your next event, let us help you! Our T Shirts and Tanks are for any weather, so don’t wait, order today!